If you are one of those IT professionals always looking for the next big thing to master and benefit from then Data Science Skills must be on top of your list to explore. The demand for data scientists is increasing at a rapid pace and so is the number of data science certificate vendors. 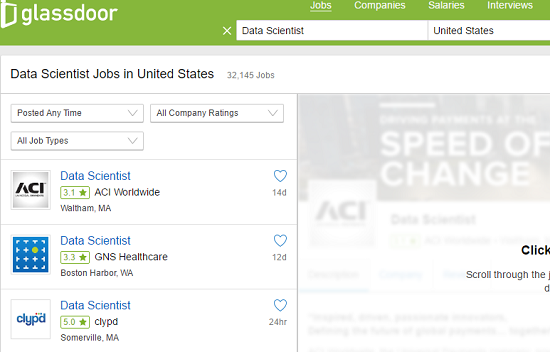 If you browse through Glassdoor.com and type in “Data Scientist”, over 32145 data scientist jobs will show up on your screen. These do not include many of the data science jobs that omit the buzzword “Data Scientist” but still require data science and analytic skills. If you would like more information about Data Science online course, please click the orange "Request Info" button on top of this page. According to Correlation One, there were 150,000 data scientists in US as of 2016 while the demand is expected to be 800,000 new data scientist job openings in the next 3 years. With exponential increase in the demand for data scientists, there is tough competition for top data science talent. Earning a data science certificate is a good start to have an edge over your peers as its gives the employers a proven ability of your skills to solve data problems. 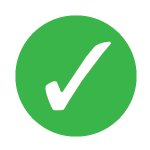 DeZyre students often ask this question to career counsellors after taking the data science online course- “What certifications are available for data scientists? “. Data science is too vast to make one’s skills evaluated by one or two data science certificates. However, a data scientist certificate gives you that extra edge over the talented pool, assuring big data recruiters that you have the real-time competence to do data science in a smarter, faster and optimized way. There are no standard, industry recognizable data scientist certification programs. However, we have picked few of the best data science and data analytics certifications that one can choose from after taking a comprehensive data science training course. Data science certification programs serve various purposes as some may test the foundational and theoretical principles of data science while others might test your data science skills through hands-on approach by exposing you to real data science challenges. It is extremely important to pursue a data science training course that will expose you to both basics and advanced methods of data analytics and data science through theoretical as well hands-on approach so that you can confront business challenges in the industry. The below list of data analytics and data science certificates highlights only the stars of the big data universe, however there a few more options that candidates can consider from. 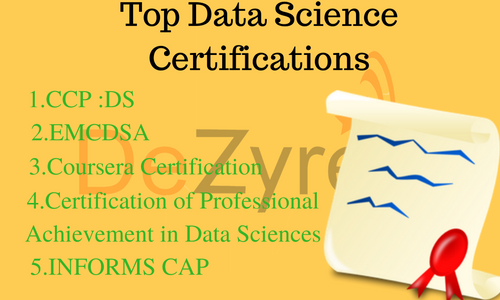 There are many other data science vendor certifications available but often professionals have several questions like which data science certification has more weight than others or is Cloudera Data Scientist Certification better than EMC, etc. There is no single answer to these questions as the data science certification you should choose depends on multiple factors like personal career goals, level of graduate education, employer’s requirements and level of data science training that you have taken. You might choose a data science certification based on your need to learn the complete data science skillset or you might want to brush up on your current data science skills or you might want to get a knack of the trending big data and data science technologies. Do you think any other professional data science certificate should have made it to the list of top data science certifications? Would you like to be updated when other readers reply to this question? It is ranked us one of the top 5 big data and data analytics certifications. CCP DS is industry’s first hands-on foundational data science certification accredited across the globe helping employers identify elite highly skilled data scientists. Cloudera data science certification consists of an essentials exam and a hands-on data science challenge that needs to be completed to earn the data science certification. CCP DS certification aims to test the skills of statisticians, machine learning engineers, data analysts and developers on various big data tools and technologies. Cloudera Certified Data Science Certification exam tests the statistical and programming skills of a candidate on a live cluster with real large datasets. To appear for the Cloudera data science certificate exam, candidate must have hands-on experience working on big data tools and technologies like Apache Hadoop, Apache Spark, Python programming, R programming with extensive knowledge of data science topics. 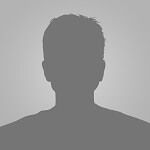 Cloudera data scientist exam does not compel you to use a specific technology to solve a given data science problem and the choice lies within the individual on as to which technology to choose for solving a given data science challenge. 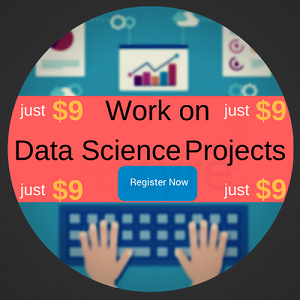 Cloudera Data Science Certification Cost – The cost per exam is 600 USD. This is a basic data science certification for people who do not have any kind of experience as data scientists in the industry and are aspiring to make a career switch. For candidates who already have a data science degree or any other advanced degree in machine learning, maths or statistics, it might seem too basic. EMCDSA requires clearing only one exam E20-007 Data Science and Big Data Analytics. EMC data science certificate exam tests a candidate’s knowledge on the role of a data scientist in the data analytics lifecycle, data visualization techniques and other advanced analytic topics through a series of 60 questions in 90 minutes. This data science certification does not expire and is good for a lifetime but updating a data science certificate every 3 years gives employers an assurance that you are updated with emerging technologies in big data and data science. Before enrolling for Cloudera or EMC Data Science certificate exam, it is necessary to buy a Data Science Course from one of the edutech portals like Coursera, DeZyre or Udacity that can familiarize you with all the essential data science concepts and terminologies. CLICK HERE to get the Data Scientist Salary Report for 2017 delivered to your inbox! The online data science certification program offered by Columbia University a non-refundable technology fee of $395 per course along with Columbia Engineering's rate of tuition,$1858 per credit. Coursera offers data science specialization through a series of short courses and a capstone project after completing all the 9 modules. The Signature track of data science courses offered by Coursera is priced at $49 each which sums up to a total of 490 USD for a verified data science certificate from Coursera. The data science course classes offered by Coursera can even be taken for free but candidates do not get any data science specialization certificate on taking the classes. 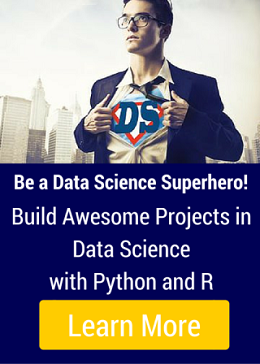 Candidates enrolling for all the 10 data science modules are only eligible for a data science certificate. The price might seem comparatively low over other certification programs but the courses are not “industry” oriented which is the only drawback with this certification. Coursera JHU data science specialization provides good value to data scientists but there is lot of scope for improvement as it is more of an introductory course and not a specialization, as the name indicates. Candidates looking to get an introduction on basic data science topics can go for it but they will have to extend upon the foundation to impress employers. This data analytics certification tests a candidate’s knowledge on the important domains of the analytic process - Business and analytic problem framing, methodology selection, model building and deployment and lifecycle management. This certification program for analytics and data science requires professionals to have at least 3 to 7 years of experience in analytics and might not be best suited for beginners in the big data domain. The cost of data science certification offered by INFORMS is 695 USD and for members of INFORMS the data science certificate costs 495 USD. Coursera Johns Hopkins Data Science Certification. 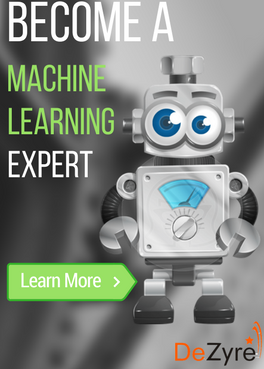 You can explore any of the data science certification programs listed here based on your data science training goals and learning needs. One or more of these data science certificates might give you a competitive edge in the industry and a smart way to spend your certification dollars is to take a comprehensive data science training online that will help you earn one of these credible badges that you can add to your data science resume. Q: Do you think any other professional data science certificate should have made it to the list of top data science certifications?